Flu and the common cold are both respiratory illnesses but they are caused by different viruses. Because these two types of illnesses have similar symptoms, it can be difficult to tell the difference between them based on symptoms alone. In general, flu is worse than the common cold, and symptoms are more intense. Colds are usually milder than flu. People with colds are more likely to have a runny or stuffy nose. Colds generally do not result in serious health problems, such as pneumonia, bacterial infections, or hospitalizations. We are so excited to be a UCPS School of Choice! When you choose to come to Western Union Elementary, you will be happy to be a part of our family! Why Choose Western Union? Western Union Elementary is a close-knit family school that has been an integral part of the Union County community over the past 75 years! When you walk through our halls, you will notice the warm and inviting family feel that our staff, students and families create. In art class, we are having fun and changing it up on Fridays- exploring art from different continents and cultures! Each class creates artwork that is reflective of a region of their grade’s assigned continent. Earlier this school year, Western Union Elementary (WUES) teacher assistant Shelly Bernabe wanted to start a crafting club at her school. But as a parent herself, she also faced the same dilemma that parents of young children know all too well: What in the world do you do with all of the arts and crafts projects your children bring home? Under the leadership of Mrs. Erb and Mrs. Tison, a select group of our 4th and 5th grade students have published the first edition of our school newspaper, Eagle Observer. The Eagle Observer staff meet after school and have taken on the task of keeping our school community informed from the student's point of view. I am excited to share with you that we will be offering a new “special” for our students next school year. In addition to Art, Music and PE, our students will have STEM as a special every week. I am sure some of you may be asking, What is STEM? or Why a STEM class? Well, let me explain a little bit of what it is and why it is so important. We are so excited to be a UCPS School of Choice! When you choose to come to Western Union Elementary, you will be happy to be a part of our family! Why Choose Western Union? Western Union Elementary is a close-knit family school that has been an integral part of the Union County community over the past 75 years! When you walk through our halls, you will notice the warm and inviting family feel that our staff students and families create. Congratulations to Mrs. McGarty, Mrs. McRorie, and Mrs. Reavis. We wished these ladies a happy retirement at the end of the 2017-18 school year. These three were at Western Union long before many of us came here. While it is hard to know how many lives you have impacted, one thing we know for sure, Western Union will not be the same without you! North Carolina State EOG (End of Grade) Testing is just around the corner for all 3rd – 5th graders. The testing schedule is as follows: May 30th - Reading May 31st – Math June 5th – 3rd Grade Read to Achieve June 6th – 5th Grade Science June 7th – 3rd Grade Re-Test Make-ups will take place June 1st – the remainder of the school year. On April 19, Western Union Elementary teacher Ashley Erb was named the 2018-19 UCPS Teacher of the Year. For winning the countywide Teacher of the Year title, Ashley received $500 for her personal use as well as a one-year lease of a 2018 car, courtesy of Union County KIA. The Union County Education Foundation also awarded her $1,000 for her personal use. Battle Of the Books is a club for elementary, middle and high school. The point of the club is to read 15 books and represent your school at a district competition. So you can tell it's a pretty big commitment to join. Not only do you have to be an avid reader but you also have to remember every little detail about the book. From the setting and characters to remembering the authors name. It’s CRAZY! A Spelling Bee is a school contest where two students from every 3rd through 5th grade class compete by spelling words. The way to win is by spelling each given word correctly. On January 15, 2018, our nation will celebrate Martin Luther King Jr. birthday. It would have been his 89th birthday. Martin Luther King Jr. was the first man to try and unite blacks and whites in our country to give them universal civil rights. Martin Luther King Jr. entered Morehouse College at the age of 15, then Crozer Theological Seminary and finally to Boston University for his doctorate’s degree. From November 29th – December 1st the students in second grade were able to participate in an in house field trip for sound. The students had previously learned about sound earlier in the year, so they enjoyed digging deeper and getting to put what they know about sound into creating various objects. The 4th and 5th Grade Eagle Chorus members had the opportunity of a lifetime when they performed at the Artists Music Guild Heritage Awards on Saturday, November 11th, 2017. Prior to the awards ceremony, the students rehearsed after school in preparation for the big event. Mrs. Reese, our Music teacher, and Mrs. Popp, a Western Union Elementary parent, co-directed the rehearsals and coached the students. On Friday, October 27th - 2017, Western Union Kindergarteners visited Country Days Corn Maze in Indian Trail! The students enjoyed several educational and fun activities such as riding on a cow train, navigating through a corn maze, sliding down a huge silo slide, playing in a corn pit, and water duck races. Students also enjoyed learning about several animals on the farm such as pigs, chickens, and goats. As part of the Global School Network, Western Union Elementary staff will be involved with specialized training through Participate to bring the world into our classrooms in the coming school year! We have started on some foundational components this year with visits to other schools, by forming a global team and preparing a plan to support the initiative! 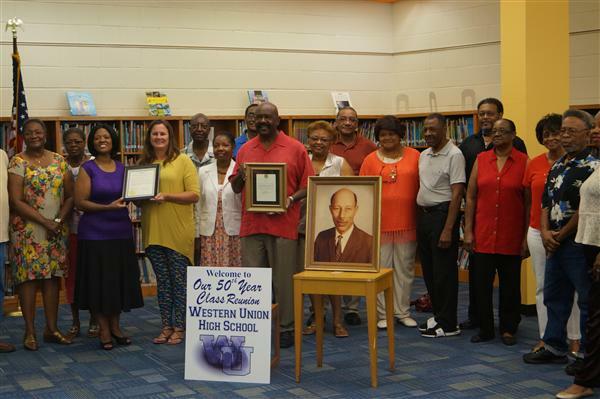 On Thursday, August 11th, members of the 1966 graduating class met to present a plaque to the principal and librarian of Western Union Elementary school in honor of Mr. John Brown, the school’s first principal. In 1966, Western Union was an All-Black High School. Several members of the graduating class toured the school with Principal Kristi Williford to see how it has changed and what things remained the same. Can you believe how fast this summer is going? We hope everyone is taking care of the three summer “R’s” – Resting, Relaxing and Reading. At Western Union Elementary we are busy preparing for the 2016-17 school year. Even though students and staff are not at school, there is a lot of work that happens during the summer. North Carolina State EOG (End of Grade) Testing is just around the corner for all 3rd – 5th graders. The testing schedule is as follows: May 26th – Reading , May 27th – Math, June 2nd – 5th Grade Science & 3rd Grade Read to Achieve, June 7th – 3rd Grade Re-Test. Make-ups will take place May 31 – June 9th. We will starting testing at 7:50, so please make sure that all students are at school on time. We know our students will "Give their best and nothing less." Farm Fun at Aw Shucks! On Friday, April 15th, our kindergarten classes enjoyed a beautiful, fun-filled day at Aw Shucks Farm! The day included lots of fun activities. The children planted watermelon seeds and decorated their cups. They were so excited about taking their seeds home to plant in their gardens. We can’t wait to see who can grow the biggest watermelon! On April 29th, the first grade class went to the Columbia Riverbanks Zoo. This was an especially exciting field trip for our first graders because this school year we have been learning about animals. The first graders have researched various animals including but not limited to their habitats, offspring, diets, anatomy among other attributes. This enabled the students to be fully prepared for the zoo exhibits and gave the students a real life experience to finally see the animals in person! In my job as a school counselor, I wear many hats. Chef Hat, Safari Hat, and Top Hat are just a few of the hats I wear. Fourth grade is quickly approaching their annual trip to Raleigh. In order to prepare, students split into three groups, each in charge of presenting on of the branches; the executive, legislative, and judicial. Voters chose their classmates for leadership roles. The Western Union Elementary third graders have had unique learning opportunities this six weeks while studying about the past. The students have compared life now to life during the time of the American Revolution. The teachers rotated through the classes and taught students about the life of children during that time period, a time line of events, major battles and the interactions that took place between Colonists and the British. Our children are lucky enough to have a VIF teacher on the grade level from Britain. They heard from Ms. Ali on how the British felt about Colonists during this time period. Fifth Grade students celebrated ‘Scotland Day’, as they learned about the culture and traditions of the country. In the morning, the students spent the day creating art work, dancing, and Scottish literature. Read Across America: Celebrating In-House Authors! Our library has been celebrating the joy of read during our Read Across America Day celebration in March. This event celebrates the birthday of Dr. Seuss by promoting reading. This year we noticed we had a theme of “In-House” authors emerge. The students in Mrs. Helms’ class are celebrating Black History Month. We began by learning about Dr. Martin Luther King, Jr. We read a non-fiction e-book, Dr. Martin Luther King, Jr. Marching for Equality, on the Promethean Board. The book allowed us to learn about Dr. King while building our reading comprehension skills. 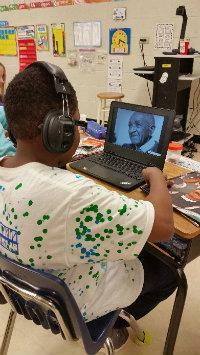 Reading about Dr. King peeked our interests in learning about other famous black Americans. Heart Healthy Living The 3rd graders at Western Union participated in a heart healthy celebration on February 16th, 2016. In science, we have been learning about the human body and making smart food choices. Kindergarten is a year of exploring new things, and this is also true in Music Class. The students begin to learn many foundations of music, such as finding a steady beat, singing with a group, and recognizing contrasts in music, including high and low pitches, loud and soft sounds, and fast and slow tempos. This month, WUES art students have had several opportunities to showcase their art talent in school and at community venues. Throughout the school day a steady stream of students enters and exit room 406--the Resource Room. Children come from grades kindergarten through fifth grade and represent almost every class at Western Union Elementary School. While your students are enjoying this much deserved Winter Break with family we wanted to give you some fun ideas to help them keep up their Math and Reading skills. The following activities and web sites are ones that can be done with family and friends as well. Our Camp Thunderbird Trip was an incredible learning experience for all of our 5th graders. We learned about Wildlife Ecology, weather, Native American culture and team building. The students loved participating in all of the hands on learning activities. A big highlight of the trip for students was conquering their fears by participating in the zipline and the rock climbing wall. In addition, students learned about food waste and how to be mindful about their daily living. Inspired and excited by the giant pumpkin on the front lawn, our classes decided they wanted to explore pumpkins further. Our students were able to decide how to connect pumpkins to math, science, language arts and emotional health. Before the pumpkins were opened, some predictions were made about the size, weight and number of seeds. Predictions for seeds in our pumpkin averaged 100 seeds per pumpkin. It turns out our pumpkin had 98 seeds. We were so close! What's New in the Computer Lab? Mrs. Young is our new Teacher in the Computer Lab! We are off to a great start on all grade levels! Our first order of business was to establish the rules and regulations of the lab, as well as expected procedures. We discussed the proper use and handling of the computers. First graders at Western Union have been learning about change in social studies. We began our exploration of change by mapping out our day at school on a time line. It is amazing how our days change continually. If you come down the first grade hallway you will notice a timeline project that was completed at home to show how the first graders have changed from year to year. The fourth grade team had fun while learning about globalization. Cooperative learning teams researched how Halloween is celebrated in many countries around the world. The teams summarized research material on a given country. They created a visual aid using teaching charts and/or Chromebooks to use in their presentations to other cooperative learning groups. In October, Kindergarten students at Western Union Elementary School learn about community helpers. The focus of learning is on the different types of community helpers, the tools the community helpers use, and the importance of each community helper. In the community of Mineral Springs/Waxhaw, there are a plethora of community helpers. The Kindergarten students were fortunate to have visits from six different community helpers. On Friday, October 9th, the Parkwood High School Beta Club came to read with second graders at Western Union. They have been coming to visit with second grade students in the Parkwood area for the past few years and we look forward to seeing them each year. About six high school students visited with each second grade class and every Parkwood student read with three or four second graders. The stories they read were from all around the world; Asia, Europe and South America. What does a Speech / Language Pathologist do? When most people think about a Speech/Language Pathologist, or an SLP, they think of someone who helps out when a child cannot say certain sounds and cannot be understood. That is only one part of my job. I tell my students that my job has two parts – Speaking and Listening (but even that does not say it all). 'Tis the season for all things pumpkin. Recently WUES received a special delivery…of a giant pumpkin! Over the past several months, 1st grader Levi Phillips and his family have been spending time getting this pumpkin to its massive size. During media class our fourth graders have been exploring the wealth of knowledge gained from the study and reading of narrative nonfiction. In fact, a recent article in Book Links magazine, “The Rising Star of Narrative Nonfiction,” by Kay Weisman, explores the resurgence of this genre, which is great because it often reads like a fictional story, but creatively presents facts because it pays close attention to plot structure and character development (Weisman 2011).